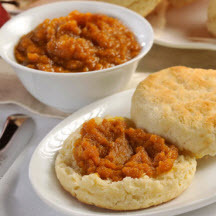 Fresh bread spread with homemade apple butter, with pumpkin as the base, is a rich treat! Combine pumpkin, apple, apple juice, sugar and pumpkin pie spice in medium, heavy-duty saucepan. Bring to a boil; reduce heat to low. Cook, stirring occasionally, for 1 1/2 hours. Serve with buttermilk biscuits, breads, corn muffins or hot cereal. Store in airtight container in refrigerator for up to 2 months.